The story and history of Saint Cunegundes. Cunegundes was the daughter of Siegfried, the first Count of Luxemburg, and Hadeswige, his pious wife. They instilled into her from her cradle the most tender sentiments of piety, and married her to St. Henry, Duke of Bavaria, who, upon the death of the Emperor Otho III., was chosen king of the Romans, and crowned on the 6th of June, 1002. She was crowned at Paderborn on St. Laurence's day. In the year 1014 she went with her husband to Rome, and received the imperial crown with him from the hands of Pope Benedict VIII. She had, by St. Henry's consent, before her marriage made a vow of virginity. Calumniators afterwards made vile accusations against her, and the holy empress, to remove the scandal of such a slander, trusting in God to prove her innocence, walked over red-hot ploughshares without being hurt. The emperor condemned his too scrupulous fears and credulity, and from that time they lived in the strictest union of hearts, conspiring to promote in everything God's honor and the advancement of piety. Going once to make a retreat in Hesse, she fell dangerously ill, and made a vow to found a monastery, if she recovered, at Kaffungen, near Cassel, in the diocese of Paderborn, which she executed in a stately manner, and gave it to nuns of the Order of St. Benedict. 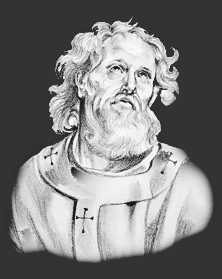 Before it was finished St. Henry died, in 1024. She earnestly recommended his soul to the prayers of others, especially to her blear nuns, and expressed her longing desire of joining them. She had already exhausted her treasures in founding bishoprics and monasteries, and in relieving the poor, and she had therefore little left now to give. But still thirsting to embrace perfect evangelical poverty, and to renounce all to serve God without obstacle, she assembled a great number of prelates to the dedication of her church of Kaffungen on the anniversary day of her husband's death, 1025; and after the gospel was sung at Mass she offered on the altar a piece of the true cross, and then, putting off her imperial robes, clothed herself with a poor habit; her hair was cut off, and the bishop put on her a veil, and a ring as a pledge of her fidelity to her heavenly Spouse. After she was consecrated to God in religion, she seemed entirely to forget that she had been empress, and behaved as the last in the house, being persuaded that she was 30 before God. She prayed and read much, worked with her hands, and took a singular pleasure in visiting and comforting the sick. Thus she passed the last fifteen years of her life. Her mortifications at length reduced her to a very weak condition, and brought on her last sickness. Perceiving that they were preparing a cloth fringed with gold to cover her corpse after her death, she changed color and ordered it to be taken away; nor could she be at rest till she was promised she should be buried as a poor religious in her habit. She died on the 3rd of March, 1040. Her body was carried to Bamberg and buried near that of her husband. She was solemnly canonized by Innocent III. in 1200. The Feast Day of Saint Cunegundes is March 3. The origin of Feast Days: most saints have specially designated feast days and are associated with a specific day of the year and these are referred to as the saint's feast day. The feast days first arose from the very early Christian custom of the annual commemoration of martyrs on the dates of their deaths at the same time celebrating their birth into heaven.